The house stands on a low rocky rise, with views across the patchwork of rocks, lochans and boggy ground - the talabh dubh (black earth - ie peaty) to the machair and dunes bordering the sea, to the hills lining the east side of Uist, and even to the more distant hills of Barra. The rocky, boggy land immediately about the house is too poor for anything other than grazing of hardy Blackface sheep, yet is prolific in wildlife. From the windows - even without the help of binoculars - you will see (and hear) lapwings nesting and performing their extraordinary aerial displays; you'll see also sparrow hawks and hen harriers, short-eared owls, lambs being born or suckling. This traditional crofter's house dates from around 1930, and was built by Donald MacLeod, the first tenant of what was then a newly-created small-holding. According to the government grant schemes of the time, materials could be obtained free of charge for a limited range of standard approved house types. The tenant supplied the labour, building the house himself with the help of family, relatives and neighbours. 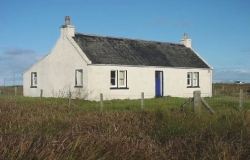 8 Askernish is one of the very few of these houses in Uist which remains unaltered externally. In the mid-1980s, the quarter-acre plot on which this cottage stands was 'de-crofted' (removed from crofting regulation - becoming a privately-owned plot), and the house with it. About 1990 the house became legally separated from the croft, and nowadays is used by a crofter from a neighbouring township for grazing sheep. The tariff shown here is for standard weekly lettings from Saturday 3pm to Saturday 10am. Shorter lettings and other arrangements are possible in low season - particularly at Christmas and New Year - please enquire. To check latest availability, and to request a booking form, contact Denise Bridge at the email address above. A housekeeping deposit of £100 per week is also payable - more on this below. Upon receiving your provisional reservation (by email, phone or post), we'll send a booking form. You should complete and return the form (within ten days to be sure of retaining your reservation) together with a cheque for 25% of the total sum (ie of tariff + housekeeping deposit) payable for your holiday: we'll confirm by return. The balance is payable six weeks before the start of your holiday - you'll get a reminder. On receiving your final payment, we'll send arrival information. In the interests of promoting sustainable energy consumption, we charge for electricity according to meter readings - at the rate it costs us. Logs and kindling - optimally dried for immediate use - can be purchased from us, again at cost. The cost of electricity and fuel is deducted from your housekeeping deposit. For babies and toddlers we can on request provide a high chair and/or cot for a small charge - please enquire. The balance of your housekeeping deposit will be refunded to you as a cheque in the post during the week after your stay.